A team of researchers from the University of Notre Dame have demonstrated a novel DNA detection method that could prove suitable for many real-world applications. 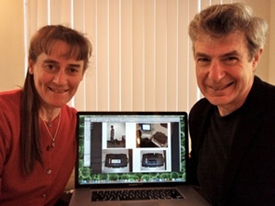 Physicists Carol Tanner and Steven Ruggiero led the team in the application of a new technique called laser transmission spectroscopy (LTS). LTS is capable of rapidly determining the size, shape and number of nanoparticles in suspension. In a new paper appearing in the international, peer-reviewed, open-access, online publication PLoS ONE, the team describes how they applied LTS as a novel method for detecting species-specific DNA where the presence of one invasive species, the quagga mussel, was differentiated from a closely related invasive sister species, the zebra mussel. The research was carried out in support of and cooperation with Notre Dame’s Environmental Change Initiative (ECI). Scientists from ECI are using environmental DNA (eDNA) as part of their surveillance of Asian carp in the Great Lakes region. The results of the research demonstrate the basic premise of DNA detection by LTS in the laboratory. The Notre Dame research team points out that the LTS technique has many benefits over established DNA detection techniques. The technique is highly sensitive and takes only a few seconds to genetically score a sample for species presence or absence. The researchers also feel that LTS technology will prove much more rapid, practical and cost effective than current detection methodologies and could ultimately reach the sensitivity required to eliminate the need for polymerase chain reaction (PCR) amplification. Although the current paper describes the use of LTS in invasive species detection, the Notre Dame researchers believe that the technique could serve as an important tool in detecting human pathogens and understanding and indicating the presence of genetic diseases such as cancer. The Notre Dame group is investigating the real-world applications of LTS technology generally and working on transitioning its success from the lab to the field. Originally published by William G. Gilroy at newsinfo.nd.edu on December 16, 2011.